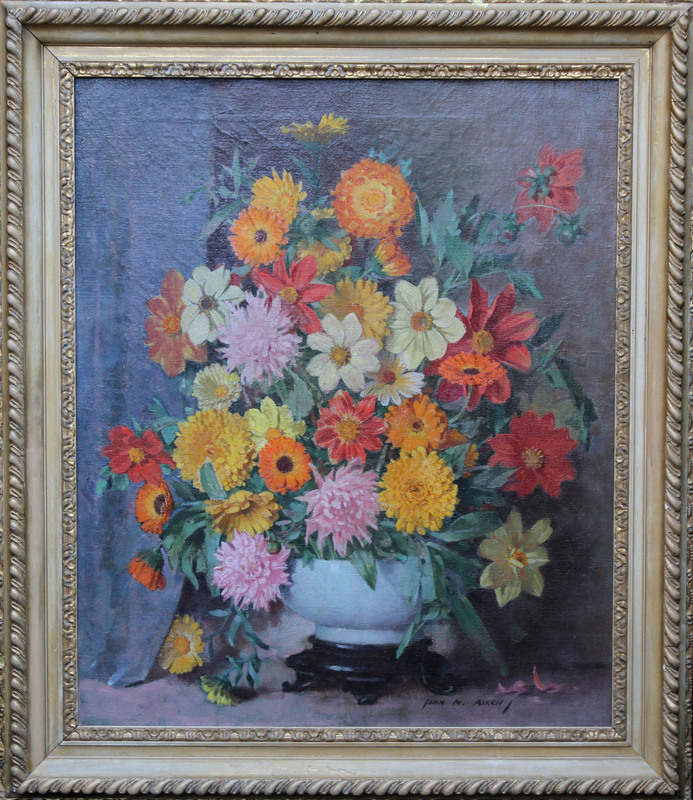 A fine floral oil painting by Scottish listed artist John M. Aiken. This is a super oil on canvas painting of floral arrangements of "Gay Companions" of yellow, pink, red and white flowers in a white jug. 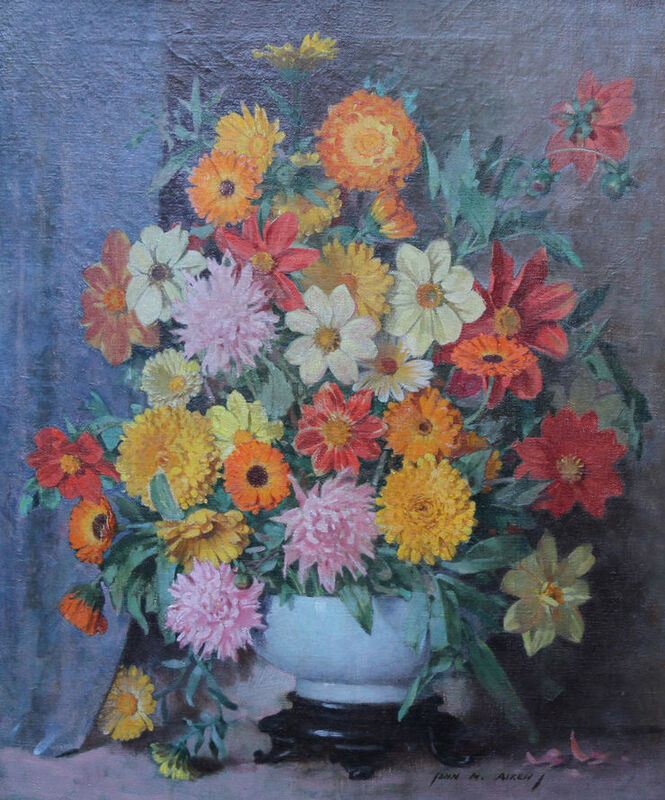 This is a fine example of a Inter War Scottish Post Impressionist floral oil with good subject. It is a good large size painting and is signed and in good condition If you want a painting by this artist then this is a fine example. Framed 39 inches by 34 inches, in good condition. John Macdonald Aiken (1880 - 1961). Born in Aberdeen, Aiken was a painter in oils and watercolours as well as an etcher and stained glass artist. After serving a six years apprenticeship as a draughtsman with the lithographer Robert Gibb, he studied at Gray's School of Art in Aberdeen and at the Royal College of Art, under Gerald Moira, as well as in Florence. He became Head of Gray's School of Art in 1911-14 before devoting himself full-time to the practice of art, and was awarded the silver medal at the Paris Salon in 1923. He lived for a time in London before returning to Aberdeenshire, and produced more than 100 etchings, 8 of which are identified in Guichard's British Etchers. Elected Associate of the Royal Scottish Academy 1923, Associate of the Royal Society of Painter-Etchers and Engravers 1924, Royal Scottish Academy 1935, Royal Institute of Painters in Watercolours 1944.